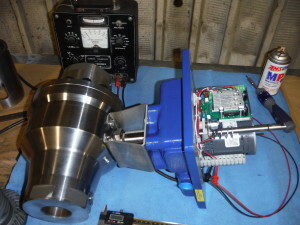 VSI delivered the first Helical Bevel Gear-drive Valve, the HBGV, on Thursday, February 18, 2016. 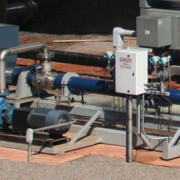 The valve will be installed as a pump back pressure regulator on an injection skid manufactured by Global Production Systems, GPS, in Shawnee, Ok.
GPS is a leader in injection systems design and manufacturing that include instrumentation and control systems permitting the multi-stage centrifugal pumps to operate most efficiently. 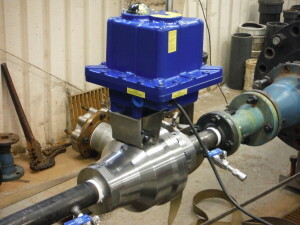 While this marked a significant milestone for VSI in the development of the HBGV, the near future looks bright as we actively seek other field trial applications for a 5,000 psi rated choked flow control valve with a flow coefficient up to 60. We have two API 6A compliant valves and one Class 1500 RF flanged valve in production, ready soon to drop in and replace problem-plagued 2″ conventional control valves. The electronic actuation system is capable of 1% accuracy with 20:1 rangeability. The final round of lab testing wrapped up this week. 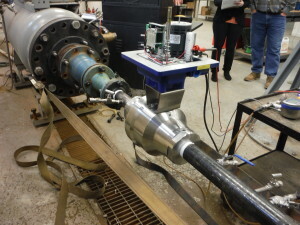 Flow test data gathered at the Radford Company valve test facility confirmed predictions of CFD simulations made prior to the launch of VSI. Maximum Flow Coefficient was measured to be 75 in turbulent flow. 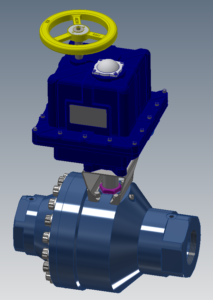 The HBGV1 was confirmed to have negligible pressure recovery in the valve and an effective CsubV of nearly 60 in full choked flow as pressure recovered far downstream. 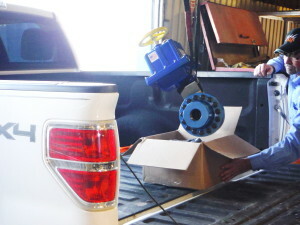 Flow testing of the HBGV began at Total Valve Systems in Broken Arrow, OK. 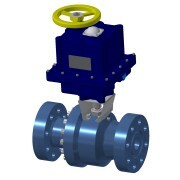 The 2″ control valve was confirmed to have a flow coefficient above 60 Cv, the primary performance specification. 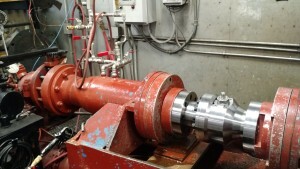 Lobo Engineering PLC is processing the 136,000 data points to establish the inherent characteristic and choked flow performance ratings. 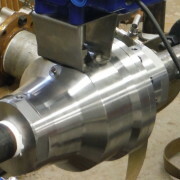 The first of five pre-production severe service control valves is prepared for flow testing and field trials. From the 3-D printed patterns for the internals to the rigorous CNC machining of the Body and Hub, the manufacturing process was complex. 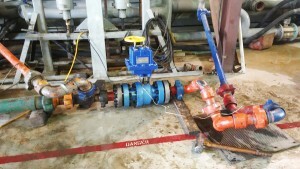 Eight contractors were coordinated by VSI to produce the valve in three months. HBGV1 Technical Brief Released – First RFQ! Last week, with the first valves in production and parts still on order, VSI received a request for quote to replace a Masoneilan 18400 LincolnLog (Trademark) control valve in water injection service, dropping 500 psi to 3 psi. 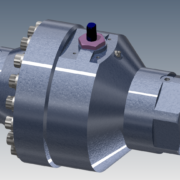 The end user is considering our offer, subject to the approval of substituting electric actuation for pneumatic. 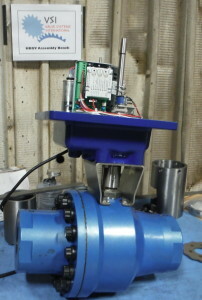 Traditional industrial control systems rely on pneumatic controls and actuation, primarily for enabling a spring-over-diaphragm actuator to open or close a valve when the pneumatic system fails. “So 20th Century”; with a simple battery backup system, the HBGV will open, close, or go to a specific position on loss of signal. 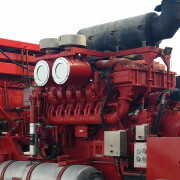 No pneumatics. No springs. No positioner. 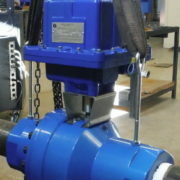 No actuator change if fail-closed valve needs to now fail-open. No problem. https://vsillc.com/wp-content/uploads/2015/08/2-inch-API-5000-Indelac-Discharge-White.jpg 1200 1900 Mark Lobo https://vsillc.com/wp-content/uploads/2015/05/vsi-logo.png Mark Lobo2015-09-24 00:16:262016-12-26 20:09:08HBGV1 Technical Brief Released - First RFQ! Ranging from difficult to impossible to machine, the four key components that comprise the patented helical bevel gear-drive must be cast. 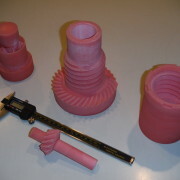 For the 5 field trial valves, the patterns were scaled up from the digital model to allow shrinkage of the molten metal part and printed in wax. 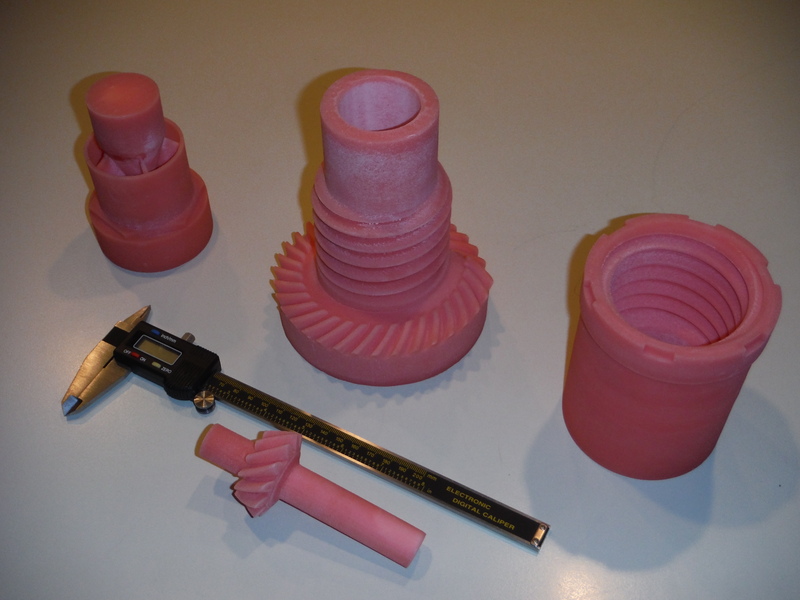 The patterns were produced by American Precision Prototyping, LLC with the selective laser sintering process at a fraction of the cost of traditional molded pattern tooling. 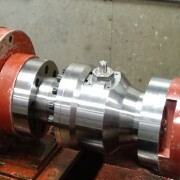 Alpha Investment Casting received the patterns and entered them into production, leapfrogging the steps of setting up permanent tooling in the injection press and molding a few patterns. VSI benefits from quick delivery of parts that meet production part specifications.